You must make reservations in order to have a guided tour of the farm. If you are a small group, less than 10, then we will need to add you on to another group that is visiting the farm. Please call for reservations. Our Produce Stand is self-serve and open to the public Monday-Saturday 9am-5pm. You are welcome to visit and walk the farm and shop our produce stand without reservations. Suggested Donation is $10 or shop from our Produce Stand. The Spring hours for walking the farm are weekdays from 12 pm-2 pm and Saturdays from 9 am- 5 pm. We are closed on Sundays. Is your pumpkin patch open to the public? Yes! In October, you may drop by the farm any time Monday-Saturday 9am-5pm to visit our pumpkin patch. While you are there you may enjoy a walk around the farm free of charge. Please note that in the morning hours we do conduct guided tours for school groups, so the farm may be busy. You will find the farm less crowded in the afternoon hours. Amy's Farm is on the border of Chino & Ontario, CA. We are 1 block north of the Chino Airport. We are in the heart of Southern California and we receive visitors from L.A. County, Orange County, San Bernardino County, and Riverside County. Our address is 7698 Eucalyptus Ave. Ontario, Ca. 91762 Visit our Map & Directions page for more info. When is the best time to visit the farm? Each season is beautiful at the farm. We are open year-round. Do you have a picnic area we can use? We have shaded picnic tables and a big grassy field for the kids to play on. The area has unlimited, free use for all of our guests. Or if you so choose, we can offer you a map of nearby parks that you could visit after your tour. The farm is wheelchair accessible, albeit a bit bumpy terrain! 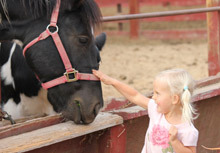 We have many special needs groups that visit the farm and have a wonderful time. What is the price of your guided tours? Our price is currently $8.00 per person. You receive 1 free adult per every 10 kids. All additional adults pay the $8.00 price. Tours last about 1 ½ hours. During October and November, you receive our Pumpkin Tour which is $12.00 per person. Adults not taking pumpkins receive the $10.00 price. Middle School, High School, and College tours are $10 per person and tours are about 2 hours. You can pre-pay or pay the day of your tour. We accept cash, checks, atm/debit, and credit cards. You may submit a purchase order to pay through your district. How many kids can I bring on one tour? We allow a maximum of 4 classes per tour (up to 120 students) and require a minimum of 10 paying guests per tour. If you need to reserve for more than 4 classes, then you will need to reserve 2 tour time slots. What is the Pumpkin Tour? If you visit us in the month of October, you will receive our Pumpkin Tour. This is our normal tour, plus, at the end of the tour each person will pick out one free pumpkin from our pumpkin patch. Our pumpkins are the perfect size for kids and good for carving. The tour costs $12.00 per person. Adults are not required to take pumpkins, and if they choose not to, then their price in $10.00 per person. I've brought my class, but now I would love to bring my family. Do you do tours for other groups besides schools? You can bring whomever you want for a tour as long as you have at least 10 paying guests. We do tours for schools, homeschools, moms clubs, special ed., boy and girl scouts, families, church groups, senior citizens, etc. If you have less than 10 paying guests, you will need to contact us and ask for some available dates of tours that you could add on to. No. However, you may book a guided tour of our farm for your birthday celebration. We do not reserve our picnic area for private parties but you are welcome to use our picnic area after your tour. We still didn't answer your question... Ask us here!